Two weekends ago, Danny Deardorff , founder of Mythsingers, played a trick on his students of magnificent proportions. Truly Royal with a capital R.
I’m participating in a course called Living Myth, Living World which meets for five long weekends during the course of a year. Each session illuminates the season, an element, a creative process, and a topic related to our mythopoetic souls. Everything we do is in a hands-on, blood and mud kind of way as we sit in a small canvas structure called a mandorla around a fire started with flint and striker. I have to tell you how much I love my fire kit. The flint comes from England, and my striker looks like a dragon which must make my northern European ancestors smile. The wee silver box they’re kept in has a magnifying glass embedded on the top and is a replica of those used by my pioneer, Daughters of the American Revolution, ancestors. How mythic is that? All my ancestors dwelling in one swell fire starting kit. Kept small purposely, the group feels like family or clan. We range in age and have widely varying life experiences. Singing, crying, laughing all feed the fire. Functional creativity abounds. I’ve noticed that’s one of the things our modern culture has lost…functional objects made one by one with artfull expression in mind. Whether it’s wearing apparel or bowls from which to eat soup, most plates and coffee mugs are massed produced, often ugly and common. Though our group hasn’t worked with clay, we have used fabric, wood, paper, plaster and leather to make Crane Bags, drums, rattles, masks and both prayer and drum sticks…each item uniquely expressive of its maker. . . and inherently useful. Rich themes evoke focused growth. In August, the theme “Stringing the Harp” took us into the bowels of a sweat lodge to explore the roots of our authenticity and then high up into the mountains on a mini-vision quest to call for the empowerment of our authority. I heard the earth calling for me, calling for my individual voice that only I carry this lifetime. I committed to making something of this blog right after that! Notice that I began blogging at Solstice nearly a year ago, but fumbled and faltered and got irrationally SHY about sharing my thoughts in this public domain. Back to Royal Trickery. The twelve of us present that weekend split into three groups for most of the daylight hours. Our separate work is to design a ritual that will make an impression on our souls. 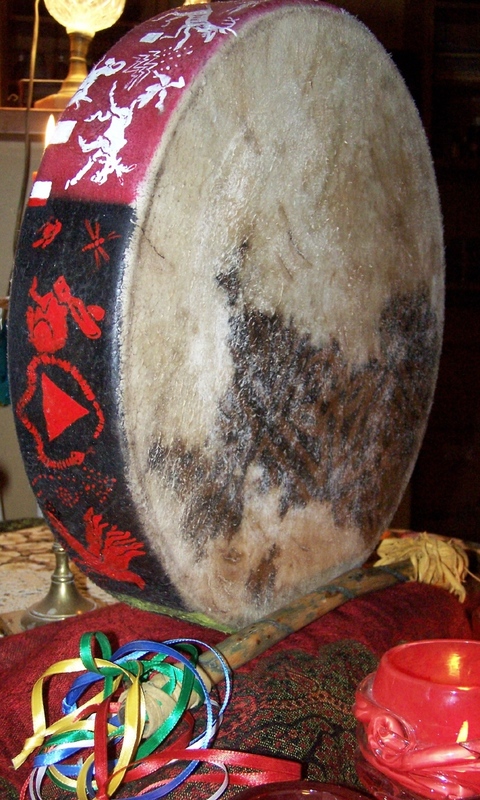 The purpose for this particular ritual is to introduce our drum to its drum stick. For the last nine months, we newbies have been playing our drums with our hands only. Which has been wonderful…I’ve learned quite a few finger tricks, and different qualities of hand “slaps”. 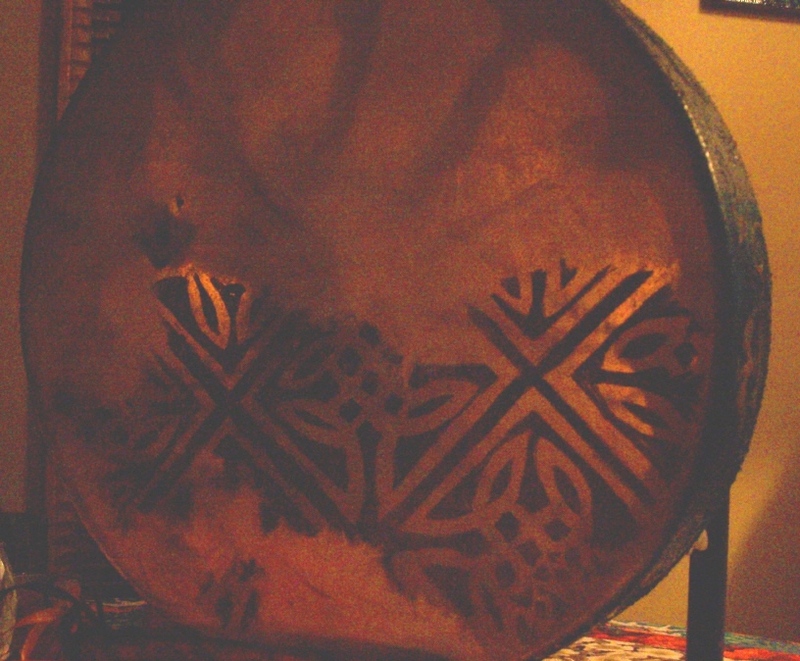 Several of us have experimented with singing into our drum and finding where it resonates. 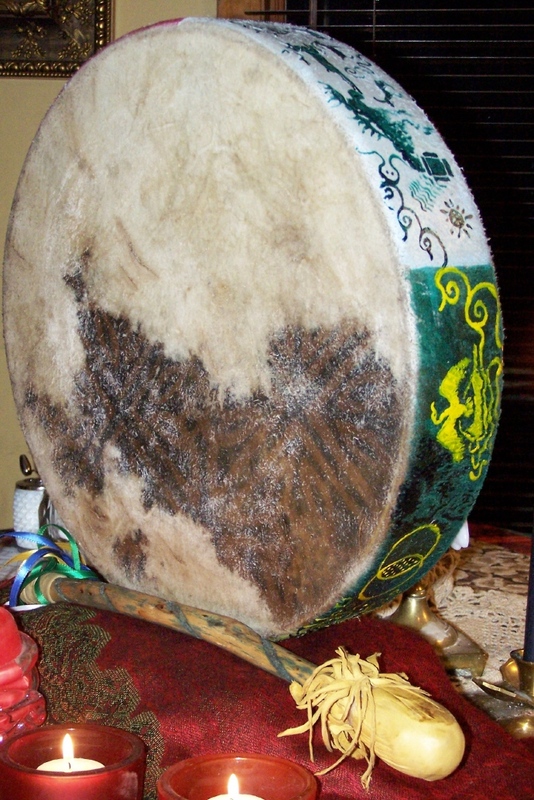 I would not have taken the time to get to know my drum so well if I’d jumped immediately into drumming with the beater. Our two mentors go into the house and stay out of our sight most of the day. The three advanced students retire into the yurt, traipsing back and forth occasionally to the mandorla, checking in with us periodically. We know they are planning something. And we also know they are meant to do our bidding…we are to give them jobs to do to make our ritual more meaningful. I suggest they need to ask us questions, three questions determined by them so it’s a surprise for us. “Another hour at least,” several say. I groan inwardly. The attention to detail is beginning to make me want to scream. Politely I offer that we need to relax into this process and remember that events beyond our control will take over the ritual once it begins. But the micro planning and the list making continue. An hour passes. The emissary returns. “Ready yet?” he asks hopefully. More planning, more details. I suggest, quite decently I thought, that we won’t remember all these specifics and that we need to trust each other…If I forget my piece, someone else will remind me. And here’s a trick of my own. I’m leaving you here . . . This entry was posted in mystery, vagaries and tagged ancestors, fire, modern primitive, ritual, soul. Bookmark the permalink. The devil made me do it, Connie!!! Now I remember why I don’t like tricks.